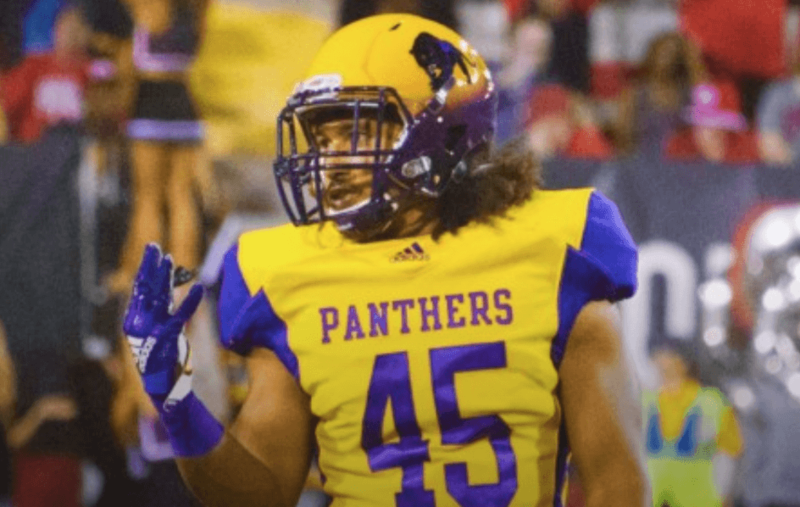 Steven Guillory the PVAMU Panthers linebacker is a stud who plays with tons of tenacity. He recently spent time with NFL Draft Diamonds interviewing with our owner, check it out! • Pearland, Texas! What I love most is just being home with my family. Its plenty of things to do but I’d rather enjoy the time with my family while I have it. Strength and Conditioning: when you come in on Sunday after a game this is the first team activity that you do. The weight room should be a second home for us after being banged up in a game on Saturday it get the blood flowing and it an opportunity to get better and compete. Film Study: without constructivecriticism how can we fix our mistakes? It makes everything a lot easier whenyou can actually see yourself making the mistakes a coach accuses you of.Because when you are on the field you may feel there was no error due to thefact that you are making plays or big hits, but when the film comes on you maysee that your steps are wrong, you’re in the wrong area, or you just aren’tfitting upright. Practice: As much as coaches preach, “what you do inpractice is what you’ll do in the game.” Many of us athletes don’t understandthe importance of this statement until you reminisce and watch film to realizesee the same play you’ve continuously missed in practice you miss in the game. • I worry that I won’t get the opportunity to play football at the professional level and I’ve put in countless hours of work, sweat, and time into this game that. Football is my passion. I’ve pursued it for so long now that it’d be hard to adjust without the sport. I can manage in the real world without it but I’d rather not. • in the Game against Texas A&M I had one job and that was to spy the QB, Trevor Knight. On one play I stepped up into the center tried to get back he grabbed my facemask just a little and Knight escaped the pocket to run in the end zone. After that my coached ripped me a new one. I flipped the switch and had no more mistakes the rest of the game got real physical and actually turned out to be one of my better games that season. • My work ethic on and off the field. I’ve told many of my teammates that they wouldn’t outwork me and to this day I’ve lived by that. My dad always told me you aren’t just competing with the people at your school you’re competing with them and everyone else so if you’re not winning where you’re at now you’re losing everywhere else. This message pertained to the classroom as well. • Christian Kirk, this man ran up and down the field on us. • My career would be coaching. I have so much knowledge about the game why would I hoard it instead of sharing it for someone else to be successful. The game is hard to stray away from so I wouldn’t dare get too far from it. • I’m not one to pretend that like saving others over my family is the right thing because I’d be devastated if I had the chance to save my family and chose not to. I’m a family man and do whatever needs to be done for them it’s always been and forever will be Family Over Everything. • Johnny Bravo because that man is a shooter, and shooters shoot. His confidence level is through the roof and he’s going to keep a couple of baddies. • One of my biggest adversities in life that dealt with football was, in high school, when signing day came around I had no offers or letter of intent. I was a standout player and people were constantly asking where I was going and I just felt lost. But I continued to work on myself didn’t look for any handouts just kept grinding until change was made. That’s when a PV coach reached out and I finally found my home. • One of my most embarrassing moment would probably be getting broke down in a football game in high school. This receiver caught a little bubble route and I ran to the play, I guess my head wasn’t on the swivel. He shook me so bad on their sideline the only thing I heard was “ooooooohhhh my gawwwddd” just the whole crowd. I made sure it didn’t happen again but that next day of film, we had never replayed a clip so much until that. • One of the most memorable plays in my college career would probably be against UNLV on the punt returner, thought maybe I wouldn’t hit him but I did, soon as the ball touched his hand I was running through his chest to not only make the tackle but cause a fumble a big turnover that we badly needed. • I work hard and I’m intelligent. I may not be the biggest or fastest on the field but if you can outsmart you’re opponent you have already won half the battle. I refuse to just lay down no matter what the circumstances are I’ve never been one to fold under pressure. • One person I’d bring back from the dead would be my grandmother I’d like to just hear her say she’s proud of me one last time and also let her know that everything she’s asked me to do I’ve stayed on track with it. • Khadarel Hodge for the Los Angeles Rams. He’s been slept on all season got in pre-season made numerous amounts of plays that some of the starters would fail to make. Came in the playoffs on specials teams making tackles on kick-off, keep in mind he is a wide receiver. • I’d much rather be respected. Just because someone may like you doesn’t mean they’ll respect you. Leaders are respected not because everyone likes them but because they do what is right and not they do what others wouldn’t even imagine doing. Respect is essential qualification for a successful career and is sought after as you progress through various stages of leadership and responsibility. It’s something that you want to earn and something that you want to bestow. • I feel for someone that most recently had off-field issues that should be somewhere in the NFL. Shawn Oakman was recently found not guilty for false accusations of title lX issues. This is a re-occurring issue that has been an issue for some time now that still has yet to be addressed. • Hate to lose, because usually when you lose it isn’t because the other team is better than you it tends to be the little mistakes that will kill you. They really do start to add up and coaches preach that every day in practice you have to be fundamentally sound to be a well-coached team. • Both my mother and father both have the most influence in my life. They’ve come from difficult times and decided they wouldn’t they wouldn’t dare let their kids come into this world the same way. They’ve paved the way for my brother and sister and many other family members providing opportunities for us to be successful and make it a trend in the family. Both of them have gone above and beyond in supporting me ever since I’ve first started playing football in the little league and have been in my corner ever since. I pray that I can do the same for my family the way they’ve done for theirs.